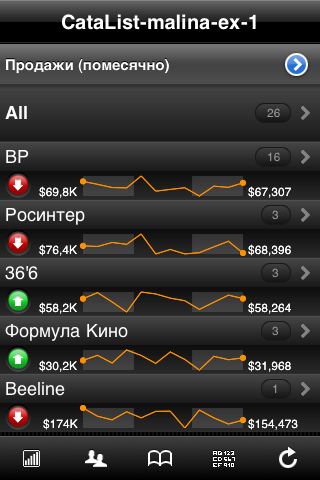 What do we look for in visualizaton tools? Present the data in a beautiful way. What do we require from the management visualization tool? To present the data exactly in the way, in which the visual look would give the opportunity to make conclusions about the data, and take appropriate decisions. You see the difference, yeah? Beautiful does not always mean correct, and correct does not always mean beautiful. But for the help we have RoamBI, which combines the both characteristics, because its creators are the real businessmen, who know what and when it is necessary for a successful management-run. Having spent quite a time playing with RoamBI, we have gained the experience loaded into the tool, and gathered our own conclusions. 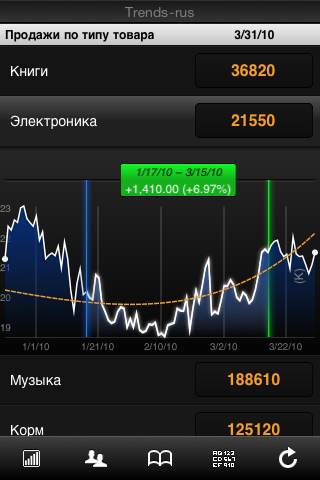 Therefore with all the interest I am giving you the detailed overview about RoamBI. To note first: RoamBI is only an iPhone/iPad child, but it uses all of the platform advantages. 1. Cardex — when you have many like-to-like objects, you can set up the eye-candy looking box with files inside, each for a single shop/site/management item. For example, it can be the group of shops, or the list of managers (with data about their performance). Each card depicts the object in a similar way. 2. Pieview is simple, and used for cases wnen you just need to plot the percentages, distributions. Noting specian, just nice-looking. 3. Catalist — a powerfull stuff, that allows to turn the big-big Pivot table from Excel into the number of smaller simple-to-understand visualizations. Cardex on steroids — this is how we call it. 4. Superlist is for the bit data sheets. Its main point — you can select and change view for any given sheet column, thus making it comparison-type. Since then you see leaders and outsiders, wins and losses — just at a glance. 5. Trends is for visualization and real analysis (!) 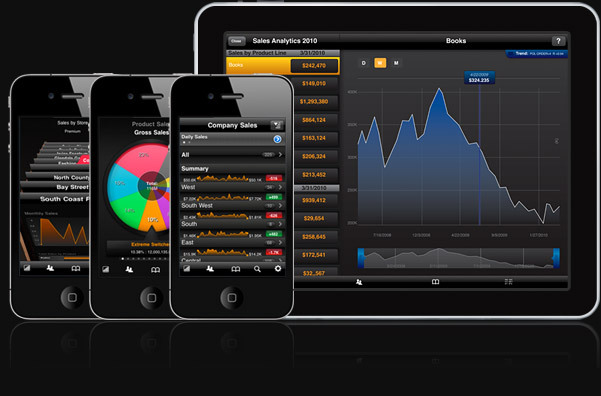 of continuous data + full usage of multi-touch interfaces of iPhone/iPad is here at its best. This report shows the graph, that you can scale with two fingers, analyze trends for any given time period, and add 4-5 slices of simple analysis (still, do not expect it to be SPSS) — money, quantities, etc. 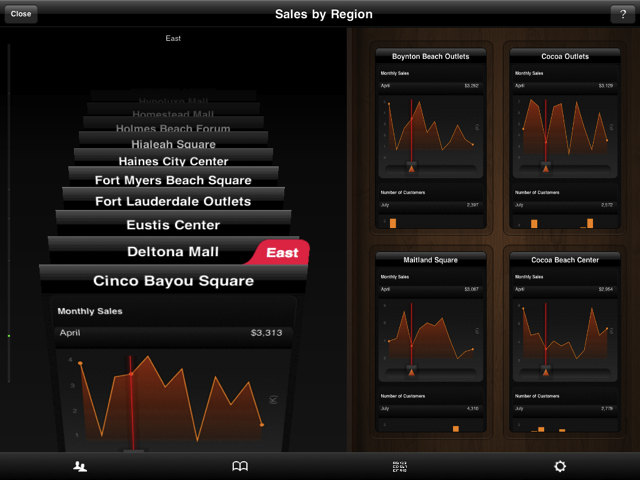 In Cardex mode on iPad you can put on the dashboard up to 4 different cards, and on linking them analyze them together. Very-very convenient, if you require a detailed one-to-one comparison, and understanding of the differences. How this all works Just like every SaaS-product does. SaaS stands for software as a service, and is described as any software, key components of which are put on the web site of the developer, while the user is given the interface to work with the remotely stored information. The easiest example is any web-based email software: every email is stored on the server, while you are viven a pleasant-looking interface to read/write emails. More details about SaaS you can see on our friendly we site SdelkaVeka. Where does the data come from? On working with RoamBI, you upload to RoamBI server your table data, set up the visualization — and that’s all. Since then you have in your iPad the regularly-updated, always available graph report, instead of the boring dull table of numbers. Pay attention: if your company is big enough, and use any BI storage (like Cognos, Oracle, or alike) — or, at leat Google Docs for collaboration — you have access to the range of extra connectors to all the most known corporate data storage types. 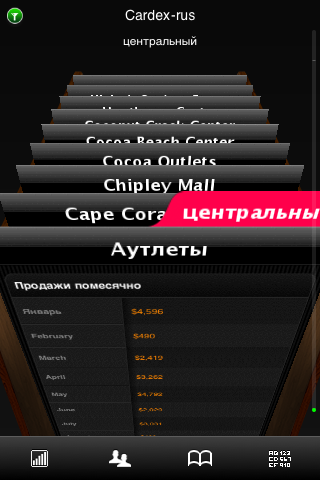 See RoamBI special descriptions on their web site. What to say — the very-very wide range of visualization opportunities! You can try RoamBI for free: RoamBI offers edition enough for test purposes. Find yours in appStore! 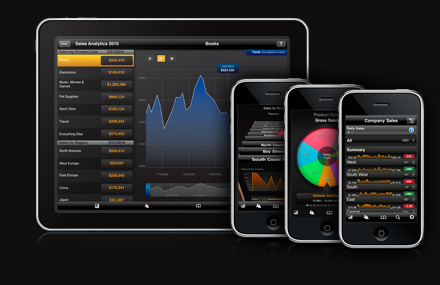 And we know how to create RoamBI dashboards at its best. Disclaimer: no real corporate numbers are shown on the screenshots in this post. Confidentiality is respected. предыдущий телефон был на андроиде, и я не совсем доволен им был. Владельцы c телефонами на винде что скажите?